MIT: Why isn’t the universe as bright as it should be? A handful of new stars are born each year in the Milky Way, while many more blink on across the universe. But astronomers have observed that galaxies should be churning out millions more stars, based on the amount of interstellar gas available. Now researchers from MIT, Columbia University, and Michigan State University have pieced together a theory describing how clusters of galaxies may regulate star formation. They describe their framework this week in the journal Nature. When intracluster gas cools rapidly, it condenses, then collapses to form new stars. Scientists have long thought that something must be keeping the gas from cooling enough to generate more stars — but exactly what has remained a mystery. This galaxy cluster comes from a sample of over 200 that were studied to determine how giant black holes at their centers affect the growth and evolution of their host galaxy, as reported in our latest press release. This study revealed that an unusual form of cosmic precipitation enables a feedback loop of cooling and heating, stifling star formation in the middle of these galaxy clusters. 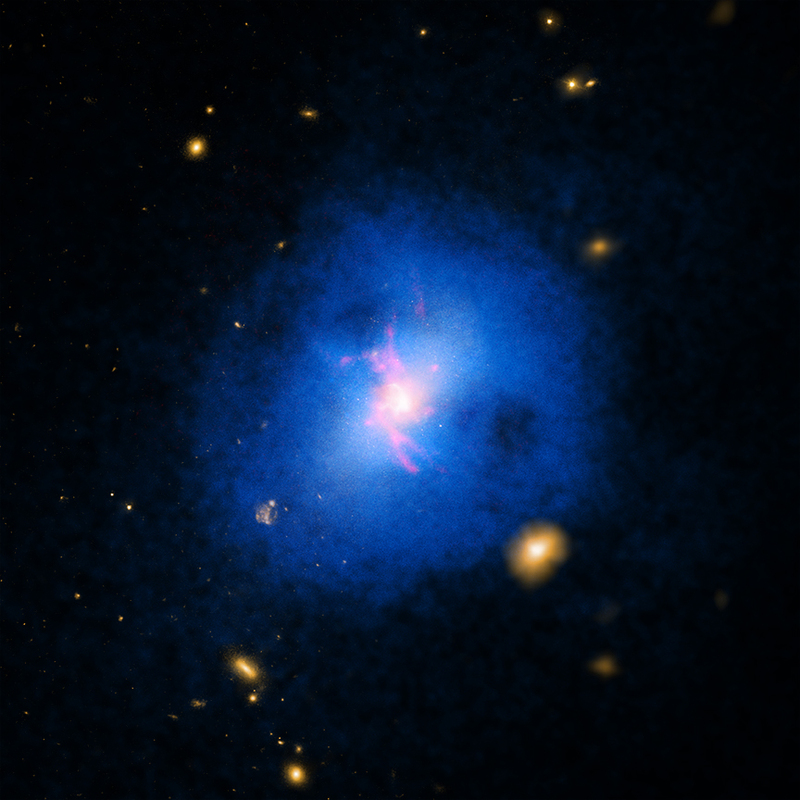 Abell 2597, shown here, is a galaxy cluster located about one billion light years from Earth. This image contains X-rays from NASA's Chandra X-ray Observatory (blue), optical data from the Hubble Space Telescope and the Digitized Sky Survey (yellow) and emission from hydrogen atoms (red) from the Walter Baade Telescope in Chile. A pre-print of the Nature study by Mark Voit (Michigan State University), Megan Donahue (Michigan State), Greg Bryan (Columbia University), and Michael McDonald (Massachusetts Institute of Technology) is available online; the study builds on work by Voit and Donahue that was published in the January 20th, 2015 issue of The Astrophysical Journal Letters and is available online.